Welcome to Chazmo's canyon site! 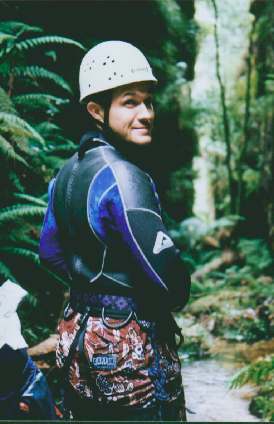 This site contains information on canyoning, abseiling and mountain biking in the Blue Mountains. My site covers aspects such as canyon types, canyon safety, equipment, and dangers. Canyoning is not to be taken lightly, it is a dangerous sport and can be fatal, if you are not aware of what you are doing. Dont become a statistic, if you are new or wishing to become a part of this rapidly expanding high adrenalin adventure sport, then go with an experienced group or club. Safety is the key to having a good time. In order to preserve our canyons and environment no canyons on this site have exact locations. To find out more drop me an email. THIS SITE HAS MOVED, CLICK BELOW FOR LINK.